On this day in 1952, undefeated North Philly welterweight, Gil Turner fought the biggest fight of his life when he took on a legend in the making, welterweight champ Kid Gavilan of Cuba. The twenty-one year old Turner was the hottest of prospects at 31-0 with 26 KOs when he stepped up for his big opportunity. His urgent, windmill style had been thrilling fans in his two years as a pro and he figured to be an interesting match for the experienced, slick & hard punching Cuban. Many felt that a fight against Gavilan was too much too soon for the still-developing Turner. But his recent body count of opponents - especially faded greats like Ike WIlliams & Beau Jack - indicated that the time was right. Gil's manager George Katz fought for the title shot and got it. The fight itself was quite a contest. Turner charged out and threw punches in his usual non-stop fashion. He landed well, especially early, scoring many shots and sending a message to the Kid. But Gavilan bit down and began to use his superior skills to not only fend off the young lion, but to begin to wound him. Gavilan hurt Turner in the fifth and sixth, but Gil kept moving forward and kept swinging. After ten rounds, the fight was even. However, the tenth was a big one for Gavilan. He hurt Turner again and for the first time in his career it appeared that Gil was running out of gas. As the championship rounds began, Gavilan turned up the heat and went in for the kill. He landed booming, unanswered shots. Turner was seriously hurt but wouldn't go down. Finally with Turner trapped on the ropes, Gavilan fired away until referee Pete Tomasco jumped in to stop it. It was a glorious win for Gavilan, a win of a true champion. For Turner, it was his most memorable fight in a career full of exciting, unforgettable matches. He would be a contender for years to come, but never again vie for a title. This great fight took place at Municipal Stadium before a big crowd of 39,025 and held the attendance record for welterweight title fights until 1980, when the first Roberto Duran vs. Sugar Ray Leonard bout finally drew more fans. 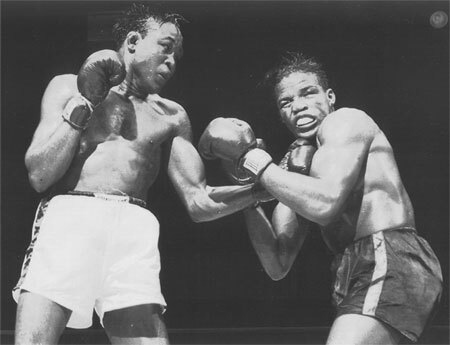 The Gavilan-Turner fight was the second of three big events held in Philadelphia during the summer of 1952. The first was Walcott-Charles IV in June and the third was Maricano vs. Walcott I in September. All three fights were held at Municipal Stadium and prompted 1952 to be called Philadelphia's greatest boxing season. The great former light heavyweight champion Tommy Loughran died on this day in 1982 at age 79. Hall of Famer Loughran was arguably Philly's all time greatest fighter. He began his career in 1919. He fought for eighteen years as a professional compiling a record of 109-30-11 with 25 no decisions and 17 KOs. In 1927, he won the title by beating Mike McTigue over fifteen rounds. He defended his crown six times - all by decision - against Jimmy Slattery, Leo Lomski, Pete Latzo (twice), Mickey Walker, and Jimmy Braddock. After the Braddock fight in 1929, Tommy relinquished the title to pursue the heavyweight champ-ionship. After beating many heavies including Max Bear & Jack Sharkey, Loughran got a shot at champion Primo Carnera in 1934. Primo defended his title by decision. In 2006, an official historical marker honoring Loughran was placed in South Philadelphia on this same date.